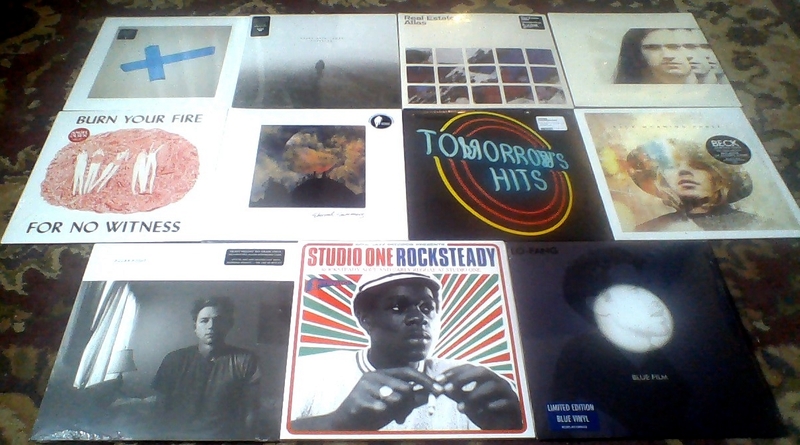 New music releases now in stock. A great bunch of releases just came out today. Plus we have the latest Beck and Lo-Fang now in stock on vinyl! Also, back in stock now are Lumineers, Fleet Foxes, Alabama Shakes, Suicide, Portishead, Speedy Ortiz and The Clash. Lushes are a two-piece rock band from Brooklyn, New York. Their first album, what am i doing, was mixed by Adam Cooke (Beach House, Double Dagger), and produced by Bachelorette (Drag City) and lushes. Stone Jack Jones’ 3rd full-length Ancestor was produced with Roger Moutenot (known for his work with Yo La Tengo, Sleater Kinney, They Might Be Giants, and many other incredible artists) and features collaborations with Patty Griffin, members of Lambchop, and Courtney Tidwell. The tales on Ancestor distill Jack’s lifetime of experience into songs that use the esoteric narratives of an American rambler to elucidate the celestial worlds within each of us. Intensely meditative, the album patiently explores the hardness of the coal mines, the mystery of suicide, the comfort of a dog’s acceptance, the idea that forgetting all you know can be the first step towards hearing and reconnecting with your muse, and one man’s gratitude for the love he’s been given and the life he’s had the chance to live. Atlas, the new album from Real Estate, was recorded over the summer and fall of 2013 with producer Tom Schick [Rufus Wainwright, Mavis Staples, Low]. To commence the follow-up to their sophomore breakout, Days, founding members Martin Courtney (guitar/vocals), Matt Mondanile (guitar) and Alex Bleeker (bass/vocals) were joined by new full-time members, Jackson Pollis(drums) and Matt Kallman (keyboard) and producer Schick this past summer at Wilco’s Chicago studio, The Loft. The songs were recorded over a two-week period and the result is the band’s most collaborative, richly detailed album to date. Anne’s proper debut LP – “Pulling Chain” leads a dark and dirty dance oozing with gothic sexuality. Combining vibing, moody synths with thumping electron- ic back beats, Pulling Chain marks a change in form as frontman David Lindell continues Anne into electronic territory. His vocals dip and tease between a lusty, bellowing baritone and a playful falsetto. Maintaining post-punk rhythmic tendencies and stepping out of the reverbed cloudiness of previous work, Lindell emerges with a collection of songs that carry a grinding, primal urgency. Many of the superlatives describing Angel Olsen refer to how seemingly little it takes for her to leave an audience speechless, even spellbound. But Olsen has never been as timid as those descriptors imply, and the noisy, fiery hints in her earlier work find a fuller expression on her newest LP, Burn Your Fire for No Witness. Here, Olsen sings with full-throated exultation, admonition, and bold, expressive melody. Also, with the help of producer John Congleton, her music now crackles with a churning, rumbling low end and a brighter energy. Eternal Summers 3rd album “The Drop Beneath” produced by Doug Gillard. Eternal Summers are a rock band from the Magic Twig Community of Roanoke, Virginia. Singer/guitarist Nicole Yun and drummer Daniel Cundiff started Eternal Summers in 2009 as a duo, and were introduced to each other quite ironically by their eventual bassist, Jonathan Woods. Their sound oftentimes draws comparisons to lo-fi music or dream pop, though the band continually strive to maintain their status as a rock n’ roll trio. This is their first album recorded in a high-end studio and, appropriately, the result is their most high fidelity album to date. That being said, it is still an incredibly straightforward record. Tomorrow’s Hits is a concise collection of songs that nonetheless expands the band’s ever-evolving musical palette. It’s full of genre-bending risks, but it reinforces the overarching theme that has come to define its makers: The Men are a great rock band. Wrapped in vintage synthesizers, drum kits and dark slinking bass lines, Pillar Point pulses with an organic heartbeat beneath a warm, analog fabric. When the vocals appear like an unhinged Ray Davies urging you to come dance, it’s an invitation you can’t refuse. Take a sunset trip out to Pillar Point and feel love like a kick drum. With excellent sleevenotes by Lloyd Bradley (author of the classic book Bass Culture – When Reggae Was King (Penguin)) this album is dedicated to rocksteady at Studio One as well as covering reggae soul and the birth of reggae. Featuring an all-star selection of artists: Ken Boothe, Marcia Griffiths, Jackie Mittoo, The Heptones, John Holt, Alton Ellis, Dennis Brown and more. March 25, 2014 New releases in stock today. January 3, 2014 It’s our Happy New Year to you sale! March 18, 2014 New release Tuesday.